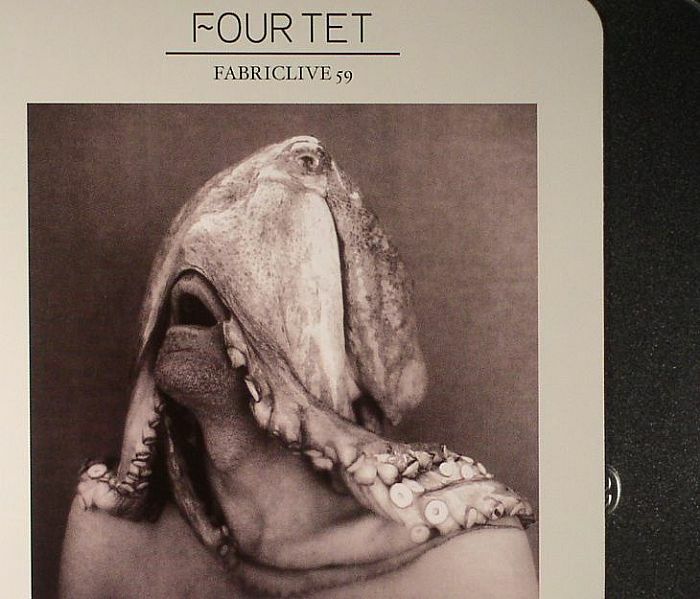 FOUR TET/VARIOUS Fabriclive 59: Four Tet vinyl at Juno Records. 2. Micheal Redolfi - "Immersion Partielle"
3. Crazy Bald Heads - "First Born"
4. Persian - "Feel Da Vibe"
6. Youngstar (Musical Mob) - "Pulse X"
7. Crazy Bald Heads - "First Born"
9. Apple - "Mr Bean"
13. Four Tet - "Fabric"
15. STL - "Dark Energy"
16. 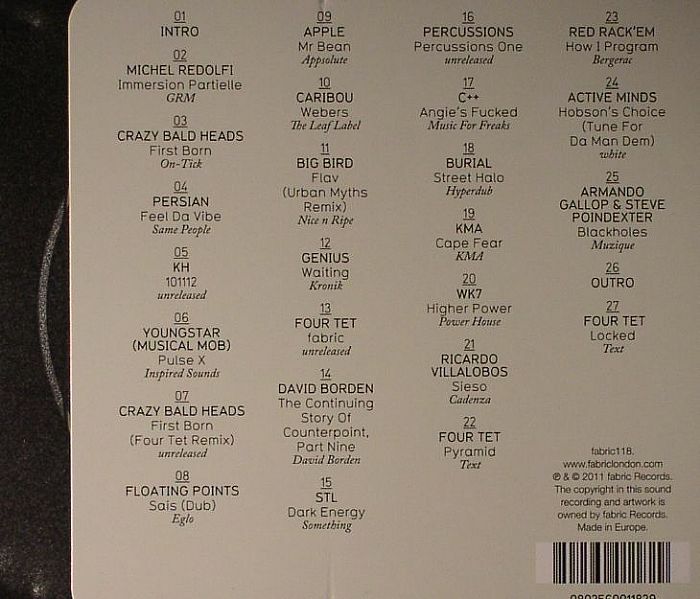 Percussions - "Percussions One"
17. C++ - "Angie's Fucked"
18. Burial - "Street Halo"
19. KMA - "Cape Fear"
20. WK7 - "Higher Power"
21. Ricardo Villalobos - "Sieso"
22. Four Tet - "Pyramid"
23. Red Rack'Em - "How I Program"
24. Active Minds - "Hobson's Choice (Tune For Da Man Dem)"
25. Armando Gallop & Steve Poindexter - "Blackholes"
27. Four Tet - "Locked"
The Fabriclive series maintains its fine run of form with Four Tet's eagerly anticipated inclusion into the canon. Stitching together field recordings of the club itself, ambient tracks from Michel Redolfi and David Borden, a selection of lost, dusty UK garage from the likes of Persian and Crazy Bald Heads and recent productions from Burial and Floating Points, it's not so much a DJ set as an impressionistic rendition of Hebden's own memories of clubbing itself. Considering the fact that Hebden's own productions are usually so saturated in melody, it's a relatively dark mix, dominated by murky bass tones and sharp, brittle beats, with a constantly shifting sense of urgency that encourages rapt attention throughout. The stellar mix is capped off with two brand new Four Tet tracks, "Pyramid" and "Locked", which only seek to highlight his growing ability to produce devastating club tracks.